Let’s take a quick poll. Show of hands if you too are sick and tired of seeing countless Elf on the Shelf photos on your Instagram feed. OK, we see you, and Dena Blizzard of the Off Broadway show One Funny Mother feels the exact same way. That’s why she’s created a genius, very adult-friendly twist on the traditional family-friendly game: Shiraz on the Shelf. For those who might not know, Elf on the Shelf is an incredibly popular game among kids. Parents hide the admittedly creepy elf toy for kids to find every morning leading up to Christmas. And, fun fact, Elf on the Shelf is actually based on a children’s picture book The Elf on the Shelf: A Christmas Tradition published in 2005 by Carol Aebersold and her daughter Chanda Bell. For Shiraz on the Shelf, however, moms and other wine-loving people place the Shiraz on the Shelf glass out each night to be filled with wine by morning. “Shiraz on the Shelf is never really hidden. It’s left in the open for a drunk lady to find!” Blizzard says in the promo video. For Elf on the Shelf, the elf is meant to watch over the kids so they’re good for Santa. 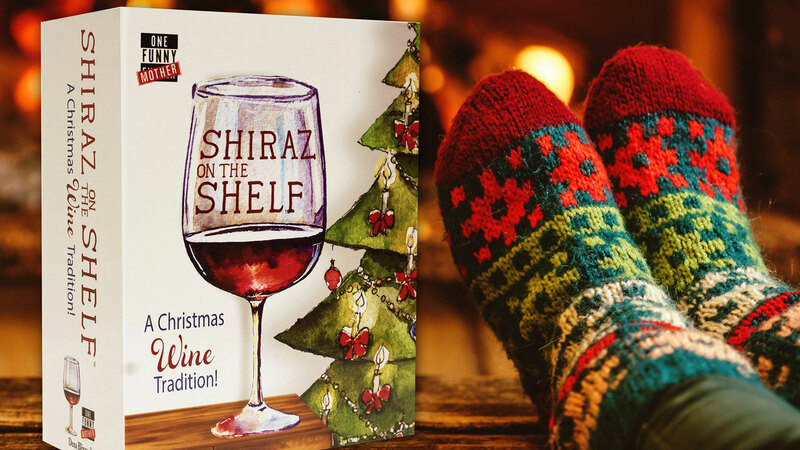 But for Shiraz on the Shelf, it’s meant for “harried, underappreciated moms out there who might need a little help to survive the holidays,” according to the product description. The packaged gift set includes a designed wine glass and an illustrated booklet inscribed with what might just become your new favorite “inappropriate Christmas poem” — and we’re dying to know what it says. “It doesn’t matter if moms are good or bad. Shiraz on the Shelf is always there in the morning,” Blizzard says in the video. Shiraz on the Shelf sells for $29.99, and we may or may not have already purchased one for ourselves.